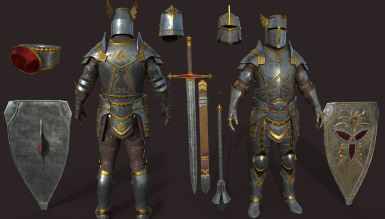 Paladin armor set, including an extra helmet, sword, mace, warhammer and ring. 5 new shrines: Sheor, Magnus, Y'ffre, Phynaster, Pelinal Whitestrake. High quality models and textures available at 4k and 2k. Lorefriendly quest for obtaining the items. To obtain permission to use my content in other mods and/or reupload to other sites CONTACT ME FIRST by PM here. If you make a translation of it, please contact me too so i can link it here and keep things organized. InsanitySorrow for the armor stand mesh. - Added Paladin's Great Helm. - Added Pelinal Whitestrake Shrine. - Better and more descriptive writing of objectives and quest journal. 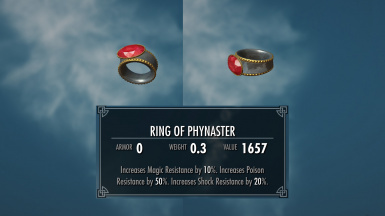 - Remade pray detecting method, now fully compatible with other mods. - No-thieves trial room now gives a warning. 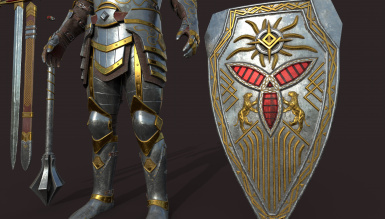 - Added Armor stand tutorial on first activation informing about unlocked crafting and armor stand usage. - Dropped minimum avatar level to 20. - Relocated phynaster shrine for easier access. - Improved shrine map and visions. - Improved crypt holy fire effect. - Added Pure Light spell which is received during the quest and opens the crypt instead of vanilla magelight spell to solve perma incompatibility. 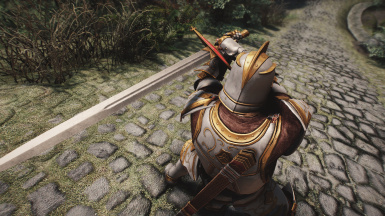 - More restricted paladin skill set on knight mentor effect. 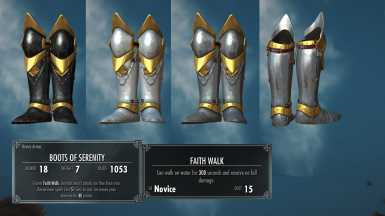 - Fixed Faithwalk not being added. - Improved chrysamere spell reflection script, now the chance depends on how well timed the block was. - Fixed some item descriptions. - Crafting materials of all items are quicksilver, corundum ingots, leather and rubies. - Tempering material of all items has been changed to quicksilver. 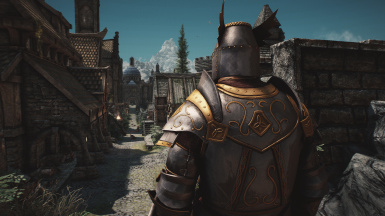 - Smithing perks have been changed to Advanced armors for armor and Ebony smithing for weapons. - Texture and nifskope settings improvements. - Improved summoning and divine guardian visuals. - New cubemap. Big visual improvement on the full set. - Candles around Sheor's shrine. 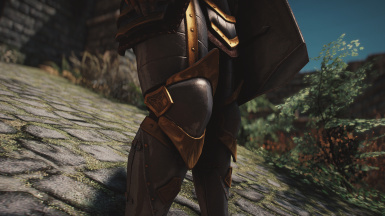 - Heavy/light armor is now an option when picking armor from the stand. - Fix invisible arm in first person. 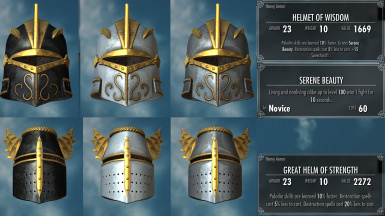 - Fix armor stand script. - Some improvements to quest's script. 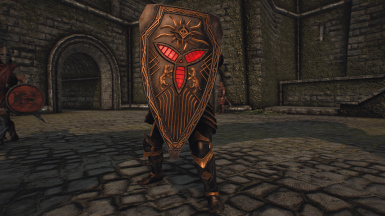 - Add vampire races to shield's armor addon. and do Good Works, and the Fountains of Grace shall once more spill forth upon you." 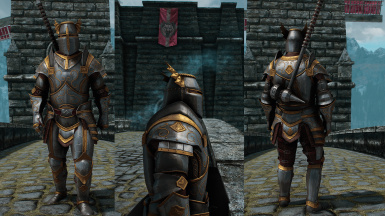 This mods adds a full set of armor and weapons inspired by Oblivion's DLC Nights of the Nine but with a completely new look based on ESO's breton armor concept art. 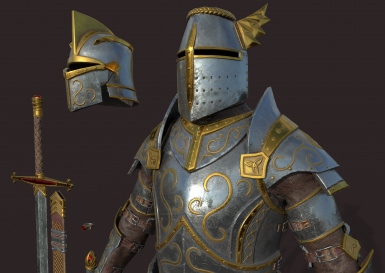 It includes the complete armor with two helmets to choose from and a ring; the sword Chrysamere; the mace Light of Day; and a warhammer called Skullcrusher. 5 new shrines have been added to the game with new models and appropiate blessings (Pelinal Whitestrake, Magnus, Phynaster, Y'ffre and Sheor). 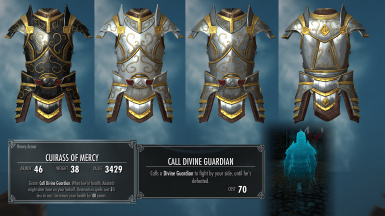 Everything is obtained through a lore-friendly quest started by praying at any shrine of the Bretony Pantheon (All but Talos) and following the commands of The Divines from there. 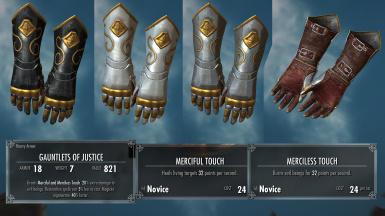 All the weapons can be obtained in two-handed or one-handed versions. 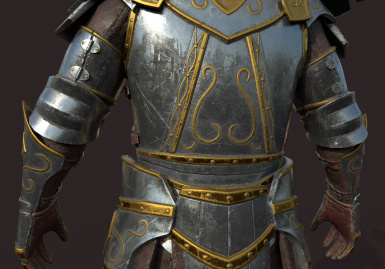 The armor in heavy or light armor (based on highest skill) and is compatible with all races, genders and body weights. 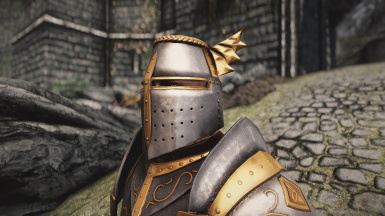 All items are balanced to fit in the game as late-game equipment and can be tempered with the Ebony Smithing perk. 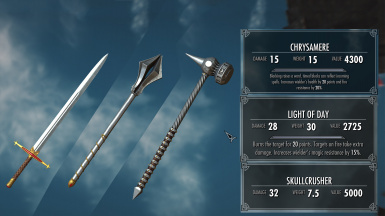 They all include custom unique enchantments with new functionalities such as bouncing enemy spells back, having access to new spells and much more. 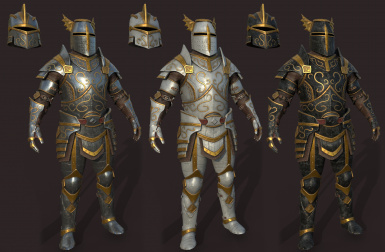 The armor set includes a degree of customization with two texture variants one can choose from in a new workbench. Additionally, once the items have been obtained one can also craft unenchanted versions of them and customize these as well. The quest has been playtested extensively by me, but if you encounter any bug do tell and I'll fix it. 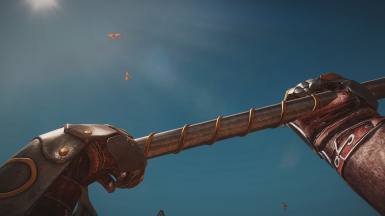 In the artistic department, all models and textures were carefully crafted from scratch and are delivered in 4k or 2k resolutions, any feedback you can provide is appreciated. 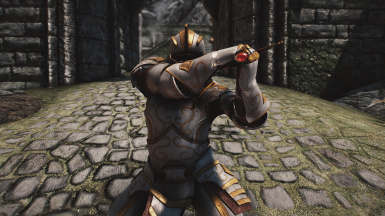 Due to a bug in Dawnguard DLC, Unofficial Skyrim Legendary Edition Patch (USLEEP) is highly recommended if using the mentioned DLC, otherwise vampires will be pacified by Woodland Grace effect as if they were animals. And of course any USLEEP patch mods you use have.